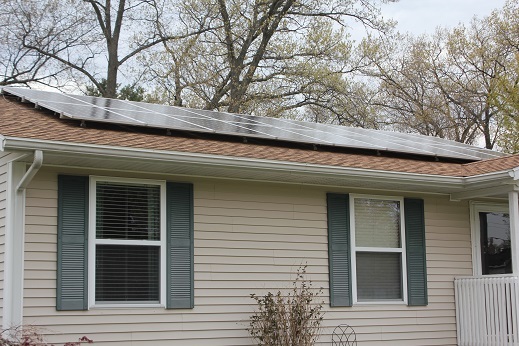 Solar PV install on Hesselink’s home. Two West Michigan residences and businesses have opted to install solar energy under the MI Solar Works program which breaks down cost barriers through zero up front cost financing that is paid back in energy generation sales. Renae Hesselink is the first in West Michigan homeowner to sign up for the program and just completed her panel install Monday May 19th. Renae served as the past Chair of the US Green Building Council West Michigan (USGBCWM) and is a local sustainability leader. “Solar PV will have a return on investment of 12 years, increase my home value and allow me to take part in the sustainability movement to get away from fossil fuels”. Renae currently is the Vice President of Sustainability at Nichols in Muskegon and is exploring this application for their corporate headquarters and distribution centers. Tami VandenBerg, co owner of the Pyramid Scheme and Meanwhile Bar is thrilled to announce the addition of Solar to both these businesses and her own home. ‘It is very important to me to do whatever I can to move toward renewable energy sources like solar. When I look at the armed conflicts in the world around fossil fuels, it motivates me to act. When I see the devastation of the regular oil spills on plants and animals and water sources, I want to act. One thing I can do is decrease my personal demand and my businesses demand for energy sources that wreak havoc on our environment” MI Solar works and AES talking with many more homeowner’s and companies who want to reduce carbon emissions and save money. Interested residents and business owners can learn more at the AES and MI Solar Works website at www.alliancees.org.